Ise, Toba and Shima areas are very accessible by Kintetsu Railway’s train. Most of domestic travellers use this train. But if you are Japan Rail Pass user, you can use the pass with small restriction. I tell you about access to this area by both Kintetsu trains and JR trains. Nagoya is a primary gateway station to go Ise. 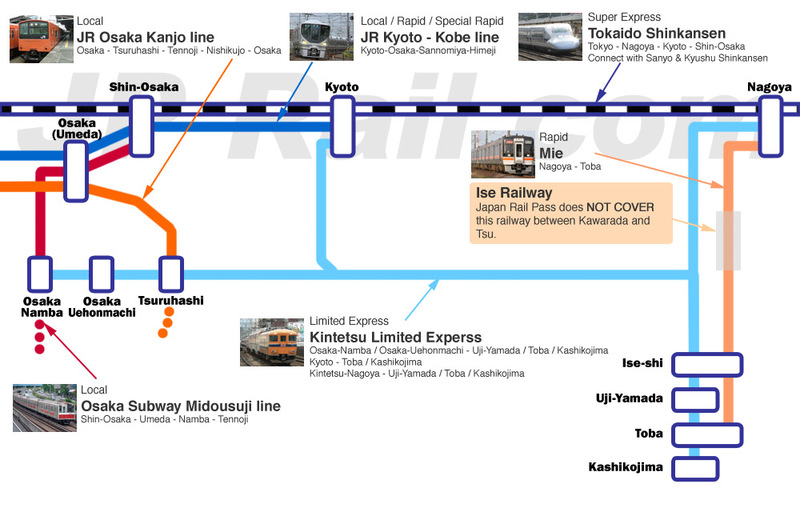 Especially if you use JR trains which is covered by Japan Rail Pass, Rapid Mie is only direct service to get Ise. Kintetsu trains go directly from Osaka, Kyoto and Nagoya. But it is not covered by Japan Rail Pass. KIHA 75 series runs as Rapid train Mie from Nagoya to Ise. Once you reach Nagoya from Tokyo, Shin-Yokohama, Kyoto, Shin-Osaka and many more stations by Tokaido and Sanyo Shikansen, simply transfer to this train, Rapid Mie. It will take you to Ise and Toba easily and directly. The trip time is around 1.5 to 2 hours. But this train goes on non JR line, Ise Railway on the way to Ise. So even this route is NOT fully covered by Japan Rail Pass. Please see the post, JR direct train to Ise from Nagoya. Rapid train Mie to get the details. And if you need more info about Nagoya station, please see JR Central official site to get the layout of Nagoya station. Kintetsu is the first railway company to introduce double decker train in Japan. Kintetsu Railway is the biggest private railway company. The trains run directly to Ise from three major ciites, Osaka, Kyoto and Nagoya. Especially if you want to access to Ise from Osaka or Kyoto, Kintetsu is much better choice than JR because of fast and direct. Kintesu’s limited express trains have same quality as JR’s limited express trains. JR do not operate any limited express train to Ise. If you want to have more comfortable trip, Kintetsu is better choice. Especially the newest fleet “Shimakaze” has very beautiful reputation. It is almost impossible to book a seat so far. Kintetsu limited express trains are operated very often. It mostly runs every one hour between Osaka/Nagoya and Toba/Kashikojima. Kyoto departure trains run less than Osaka and Nagoya departure trains. But regular express trains from Kyoto takes you Yamato-Yagi and transfer to limited express trains from Osaka. If you use Kintetsu limited express trains, use Kintetsu Rail Pass. Regular type that is sold at 3700 yen is cheaper than round trip to Toba from Nagoya by limited express. It gives you great deal. I strongly recommend you to use this pass! I am planning to visit Toba from Kurashiki on June 19 and then go to Shuzenji from Toba 2 days later. I have purchased a JR pass for my trip. I see that from Kurashiki to Toba, I would need to transfer from the JR Shinkansen to either Kintesu Limited Express to Rapid Mie at Nagoya. I read your other article and I wanted to confirm if Rapid Mie was the better/more economic option? Can I purchase the tickets at Nagoya Station? It appears that the duration from Nagoya to Toba is similiar on the Rapid Mie vs. the Kintesu Limited Express. From Toba to Shuzenji, I assume I would take the same train back to Nagoya and then transfer to the JR Shinkansen? Would I purchase a round trip ticket or is there another more economic pass? If you could help, that would be great! You have JR pass. So most part of your trip is covered. As you read the post about Rapid Mie, you have to pay for non JR segment. And also you have to pay for Mishima to Shuzenji. If you meant to purchase reserved seat ticket, it’s also covered. You can reserve your seat at the ticket window in any major JR stations. Kintetsu limited express is not covered at all by JR pass. So Rapid Mie is obviously better way. Shinkansen is the way for other segment in your trip. I will be travelling to Nagoya to Ise Shima in Feb 2019, I wonder is the Aozora Free Pass 2,570 yen free pass by JR Central still valid? Was unable to find any information on the Aozora Free Pass on the JR Central English website. Just to check if this pass is able to use on Sunday? Cause some websites states that the pass is able to use on Saturdays & National holidays only. It’s still available. It’s valid on Sunday too. I think I wrote everything about it. Please read the post above again. And if have any more questions, please let me know what you want to know. We’re planning a trip next year and was wondering how do we get from Mt. Koya to Ise Pennisula then to Kyoto… hope you can help us. I think you can find the route among Osaka, Ise and Kyoto in the post above. Mt. Koya can be accessed from Namba. So after visiting Mt. Koya, you need to go back to Namba. There is no direct routes from Mt. Koya to Ise. 1) 3rd Dec arrive at KIX airport. Airbnb in Dontonburi from 3rd Dec till 8th Dec. I am confused by the 3 options (Kansai thru pass, JR Pass, Kintetsu Rail Pass)??? In Singapore (where I am from), most people talks about JR Pass but I think Kintetsu rail pass is more suitable for my itinerary? Correct? Or is it even better to buy the Kansai thru pass? You need Kintetsu Rail Pass. This is only pass to cover Ise area. You can use it from 8th to 11th. But this pass is valid for 5 days. You have one more day. If you intend to visit Nara when you are in Kyoto or Osaka, you should use this one day for trip to Nara. Nara can be accessed from either Kyoto or Osaka. 7th Dec (day trip to Nara from Nippombashi). 8th Dec (Nippombashi to Iseshi). 9th and 10th Dec (places around Shima, Toba and Shima). 11th Dec (Iseshi to Kyoto). But when I search on hyperdia versus search on Kintetsu website, the routes recommended are different. Which one should I rely on?? You can use Kintetsu website. Hyperdia shows you the best routes in all railways. It includes the train which is not covered by Kintetsu pass. Kintetsu website shows you Kintetsu train only. It’s covered by the pass. I will be travelling from Tokyo to Ise City. What is the best route but cheap transportation that you can suggest? If you visit only Ise, there is no deals available. Only JR Pass covers your trip. But one way fare + Shinkansen surcharge is less than half amount of JR Pass 7 days. Even if you have round trip in 7 days, you still cannot get the worth of the pass. But if you have another trip, you may get the worth of 7 days. I will be arriving in Osaka (KIX) next Feb at around 4pm. Will you be able to provide a cheapest route to Ise-Shi Station? Time isn’t a factor for me here. Thank you for your reply and help on this! Kintetsu home page for timetables of trains to Ise but they are in Japanese. Would you have a link to an english version? Unfortunately I couldn’t find any timetable in English. Only Hyperdia gives it to you. I hope also to go back and see the new kintetsu terminus at abenobashi and the surrounding area, after the construction of Japan’s tallest office building above it. When I visited in this past March, Abenobashi building was still under construction. But it looked quite tall. Especially Abenobashi/Tennoji area do not have such high rise buildings, like Umeda. I haven’t taken Kintetsu train for a ling time. I really want to take the newest train, Shimakaze! Next Next post: Suica & N’ex ticket. Very flexible and good deal for tourist who stay in Tokyo.